The operation is designed to address laxity of the upper arm that typically accompanies major weight loss. A brachioplasty is also known as an arm lift or upper arm lift. The operation is designed to address laxity of the upper arm that typically accompanies major weight loss. Because of this severe laxity and hanging skin, many patients feel self-conscious wearing short sleeves and also feel limited in their physical actives. 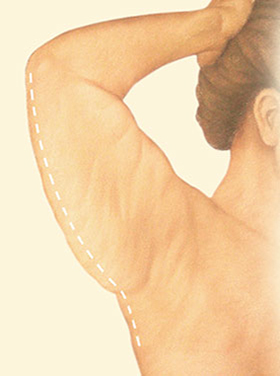 Patients seeking surgical correction to achieve a tighter, slimmer, more contoured arm. 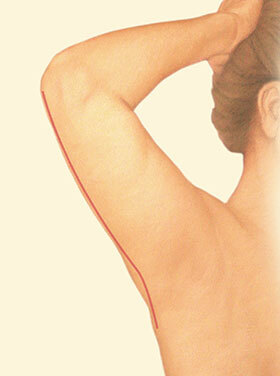 Healthy patients that are troubled by loose skin of the upper arm maybe candidates for a brachioplasty. Many patients have undergone significant weight loss and have been able to maintain their lower weight for at least 6 months. To minimize the risk of potential complications, patients should not be active smokers for at least 6 weeks prior to and following surgery. Patients also must be in good medical condition without significant cardiovascular, pulmonary, or renal disease. Dr. Neil J. Zemmel performs brachioplasty arm lift surgery in the hospital setting. This ensures that your surgery takes place in the safest most reliable medical setting available. Your surgery will be performed in the main operating rooms of a Richmond area hospital. You will also be admitted overnight for pain control and hydration. Dr. Zemmel find that patients are more comfortable and heal better when they are kept overnight. At your initial consult, you will meet with Dr. Zemmel to discuss your concerns and your desired outcomes of surgery. Dr. Zemmel will review your medical history, paying particular attention to your weight loss history as well as your past surgical history. In addition to evaluating your specific concerns, Dr. Zemmel will also perform an assessment of your overall health to identify underlying medical conditions that may affect your results, such as uncontrolled hypertension or diabetes, smoking, and a history of scarring following previous surgery. Based on your history, you may be asked to see your primary care physician prior for a preoperative assessment. Please inform the Richmond Aesthetic Surgery team of any difficulties you may have had with prior surgeries, of all current medications you may take, including supplements, and whether you are actively smoking. If you are an active smoker, you will be asked to stop smoking for at least 6 weeks prior to surgery and to cease smoking for 6 weeks after surgery. Smoking cessation will minimize your risk of potential complications in wound healing and maximize the likelihood of an excellent result. Based on your evaluation, you will be provided with a detailed surgical plan, tailored to address your specific concerns. Dr. Zemmel will thoroughly discuss the operative plan, risks, and realistic outcomes of your surgery. On the morning of surgery, you will meet with Dr. Zemmel, who will answer any final question you may have. You will also meet with a Board Certified Anesthesiologist and Nurse Anesthetist. Please inform them if you have had any difficulties with anesthesia in the past. You will meet our experienced intraoperative nursing staff who will care for you during surgery. After presurgical markings are performed, you will be taken back to the operating room for surgery. Surgery is then performed under general anesthesia and usually takes 90 minutes to 2 hours. The incisions are made and excess skin and fatty tissue are removed. The incisions are closed using all absorbable sutures so there are no long lines of stiches to remove after surgery. In most cases a drain tube is place under the skin. The drain is typically removed 5 days after surgery in the office. You will be given complete instructions on wound care, drain care, and your overall activity restrictions. Occasionally a brachioplasty is performed at the same time as another body shaping procedures such as breast enhancement or tummy tuck surgery. In this case, surgery will take longer. The exact operative plan will be discussed at length during your initial consultation with Dr. Zemmel. After surgery, you will notice that your arms will be wrapped in a light compression dressing. Soft drainage tubes will be placed deep to the incisions to collect any fluid that may accumulate after surgery. Your nurses will show you how to care for these drains. These drains are usually removed 5 days after surgery, depending on how much fluid is draining. You will notice some postoperative swelling and bruising that usually resolves within 1 to 2 weeks. Within the first 1-2 weeks of surgery, you will be placed in a compression garment of a spandex-like material, to assist in reduction of the swelling and in the recontouring of the arms. Some patients will develop some numbness along the incisions, which usually resolves within several months. Your newly reshaped arm contours will become more evident as the swelling and bruising subsides. In most cases, you will see noticeable improvements within the first few weeks from surgery. In some cases, it may take up to 3 to 6 months to appreciate your new look. Complications from brachioplasty include bleeding, infection, long-term scarring, asymmetries, and wound healing complications. Fortunately, all of these occur rarely. Occasionally, patients may develop fluid collections, called seromas, under the incisions that accumulate even after the drains are removed. In most cases, these fluid collections can be drained with a simple office procedure. Some patients will develop numbness along the inner aspect of the upper arm. This numbness usually resolves within approximately 6 months of surgery; however, in rare cases, it is permanent. To learn more about arm lifts or to schedule a consultation, please contact Richmond Aesthetic Surgery today. A body lift or belt lipectomy is a surgical procedure that is designed to address excess skin and fat of the lower abdomen, back, lateral thighs, and pubic area. The operation addresses the laxity and deflation of the lower abdomen and lower back in patients that have undergone significant weight loss. Many patients who undergo significant weight loss, especially after bariatric surgery, develop significant changes to the appearance of their abdomen, trunk, and legs. The changes that occur differ from between individuals and are dependent on a variety of factors. Some of these factors include: starting body mass index (BMI), degree of weight loss, time frame loss, genetic patterns of fat deposition, and degree of skin/soft tissue deflation among others. In the majority of patients, weight loss around the midsection occurs in a manner akin to an inverted cone. Loose skin and deflated soft tissue fall due to the pull of gravity and collects around the midsection, resulting in the “spare tire” that is troublesome to many patients. Although regular exercise will tone and strengthen the underlying muscle, it will not tighten loose skin that has been stretched over many years. A number of permanent structural changes occur in skin that has been stretched beyond in normal capacity to snap back. On a microscopic level the collagen and elastic fibers, which give skin its strength and elasticity become fractured. Such loose skin can also be thought of as a pair of pants with an elastic waistband that has been permanently stretched. The only way for these pants to fit again is to tighten the loose waist band or the loose fabric. A body lift essentially tries to “take in” the suit of skin and soft tissue that overlies the body’s underlying skeleton and muscles for a leaner and “tighter” overall appearance. Body lifts are extensive surgical procedures that should only be performed by surgeons with experience in the recontouring of patients following major weight loss. Dr. Neil J. Zemmel is a Board Certified Plastic Surgeon with experience in this specialty. One of the most important components in a obtaining a good result is in careful preoperative planning to outline a surgical plan that will address a patient’s unique concerns. Prior to surgery, a patient will undergo careful presurgical marking while standing. Occasionally this marking is done the day before surgery to allow for meticulous marking without time constraints. Once the patient is asleep in surgery, surgery will proceed with the patient in the supine position. In this position, removal of excess abdominal skin, tightening of the underlying abdominal wall, and recontouring of the pubic area can occur. The patient is then placed on her side in order to remove the loose skin of the thighs and lower back and to tighten the buttocks. The patient is then rotated to address the opposite side. Numerous soft drainage tubes are placed deep to the incisions to collect any surgical fluid that may accumulate following surgery. Medical status: many of the medical conditions that are a byproduct of morbid obesity are frequently corrected or stabilized by major weight loss. In addition, patients that have undergone surgical weight loss will have specific nutritional requirements that require maintenance for overall good health and to ensure proper wound healing. The ideal candidate for a body lift is medically stable and is following the medical and nutritional plan that has been outlined as a part of their bariatric surgical care. Psychological status: the changes in body shape that occur following weight loss often can affect the way an individual feels about him or herself. The ideal candidate should be in a “good place” psychologically before proceeding with body lift surgery. Weight loss status: patients should be at or within a reasonable range of their goal body weight for a minimum of 1 year before proceeding with surgery. Dr. Zemmel and his staff were excellent. They made me feel relaxed during a very difficult time in my life. It was reassuring to have a physician that knew exactly what I needed before I could ask. When I first met Dr. Zemmel in April of 2013, he said ‘do not worry, I am going to take great care of you’. He never fell short! He exceeded my expectations from our very first interaction. I will never hesitate to refer patients to Dr. Zemmel and his staff. He is everything a physician should be (and much more). At your initial consult, you will meet with Dr. Zemmel to discuss your concerns and your desired outcomes of surgery. Dr Zemmel will review your medical history, paying particular attention to the factors described above. In addition to evaluating your specific concerns, he will also perform an assessment of your overall health to identify underlying medical conditions that may affect your results, such as uncontrolled hypertension or diabetes, smoking, and a history of scarring following previous surgery. Based on your history, you may be asked to see your primary care physician prior for a preoperative assessment or your cardiologist for clearance for surgery. If you are under the active care of a psychiatrist or psychologist, you may be asked to obtain preoperative psychiatric clearance prior to proceeding with surgery. Please inform the Richmond Aesthetic Surgery team of any difficulties you may have had with prior surgeries, of all current medications you may take, including supplements, and whether you are actively smoking. If you are an active smoker, you will be asked to stop smoking at least 6 weeks in advance of your procedure. Smoking cessation will minimize your risk of potential complications including infections, skin and tissue loss, wound dehiscence, and poor scarring. All patients will receive a short course of anti-coagulant therapy after surgery to minimize the risks of blood clots in the legs, or deep venous thrombosis. Based on your evaluation, Dr. Zemmel will provide with a detailed surgical plan, tailored to address your specific concerns. Dr. Zemmel will thoroughly discuss the operative plan, risks, and realistic outcomes of your surgery. He will review the planned incisions, and what you can expect shortly after surgery. As indicated above, a body lift is a complex surgical procedure that should be performed by a Board Certified Plastic Surgeon experienced in body contouring following major weight loss such as Dr. Neil J. Zemmel. Your surgery will take place in a local Richmond area hospital, in a fully accredited operating room. You will have a full team of operating room nurses, Anesthesiologists, Certified Nurse Anesthetists, and support personnel to ensure your receive the best surgical care possible. You will also be admitted to the hospital overnight for observation and safe keeping. You will have a private room. You will receive IV pain medicines, IV medicines for nausea if needed, and IV fluids. Dr. Zemmel believes this type of complex surgery should be performed in the hospital setting for your safety and to ensure your best outcome. On the morning of surgery, you will meet Dr. Zemmel, who will answer any final question you may have. You will also meet a Board Certified Anesthesiologist and Nurse Anesthetist. Please inform them if you have had any difficulties with anesthesia in the past. You will meet our experienced intraoperative nursing staff who will care for you during surgery. To minimize your risks for complications during surgery, Dr. Zemmel and the nurses will take special precautions. Once you are asleep, you will be positioned in such a way to prevent undue pressure on your skin. To keep you warm in surgery, special heating pads will be placed under you, and all IV fluids will be warmed. Special squeezing devices will be applied to your feet and calves to prevent the development of blood clots in the blood vessels of your legs. Following your surgery, you will be admitted to the hospital for observation and pain control. You will be provided with round-the-clock nursing care to ensure patient safety and comfort. In addition to your home medications, you will receive intravenous pain medications and a medication to prevent blood clot formation. Shortly after surgery, you will be encouraged to get out of bed with assistance. Most patients are ready for discharge after about 1 to 2 days. Prior to discharge, you will be given instructions for home care of your surgical drains and for follow up with your doctor. Shortly after surgery, you can expect to have some difficulty initially getting out of bed. You will require some assistance in ambulating for the first few days. You may notice that you will need to walk with a slight bend at the waste for a few days. In time, you will be able to walk upright again. In most cases, surgical drainage tubes are removed within 1 week of surgery, although occasionally they will remain in place longer. You will be able to be discharged from the hospital once your pain is controlled with oral medications, you are tolerating a diet, and you are voiding without difficulty. Once at home, you will be able to resume light routine activities of daily living. You should refrain from resuming vigorous exercise for at least 3 to 4 weeks, although you can resume walking as tolerated. You will have moderate swelling and some bruising following surgery. The initial bruising will resolve within about 2 weeks; however, the tissue swelling may persist for several months after surgery. It is important to remember that a belt lipectomy is a reshaping operation and not a weight loss procedure, so you may see minimal change in your overall weight following surgery. However, you will notice a significant improvement in the way in which you look and fit in clothing as the initial postoperative swelling subsides. Scars will fade and flatten over time; however, the scar maturation process is slow and may take as long as 18 months to achieve its final appearance. Once your wounds are healed after 2 weeks, Dr. Zemmel will prescribe a custom scar gel to minimize your scar post-operatively. Although considerable efforts are taken to reduce their risk, complications can occur following body lift surgery. The complications of a body lift include bleeding, infection, delayed wound healing, unpredictable or undesirable permanent scarring, unexpected reaction to anesthesia, and blood clots in the legs or lungs. Some patients may develop numbness adjacent to the incisions that may take 3-6 months for resolution. In rare cases, the numbness is permanent. Given the unpredictable nature of the healing process, patients may require additional procedures to address persistent asymmetries or areas of residual soft tissue laxity. Occasionally, patients may develop fluid collections, called seromas, under the incisions that accumulate after the drains are removed. In most cases, these fluid collections can be drained with a simple office procedure. To learn more about body lifts or to schedule a consultation, please contact Richmond Aesthetic Surgery today. A thigh lift is a surgical procedure that is used to reshape thighs that have lost contour due to severe skin laxity. Following major weight loss, some patients find that they have a significant amount of skin laxity of the inner and outer thighs resulting in a loss of a smooth thigh contour. Patients may find they have soft tissue rolls that hang over their knee. As a result of these changes, patients can be self-conscious wearing shorts or skirts. Functional issues including rashes and chafing of the skin may also be problematic. Thigh lifting is most commonly performed on men and women who have undergone major weight loss surgery. 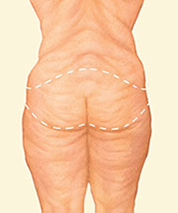 It is particular helpful in patients in whom liposuction alone is not sufficient to reshape the thighs. 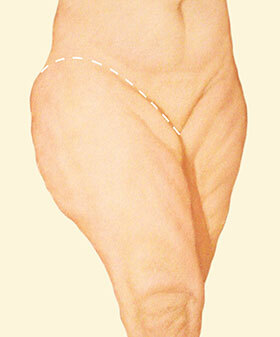 To recontour the thighs, a series of incisions are designed to include the areas of loose skin. In most cases, this involves an incision from the inner aspect of the medial thigh that extends to the level of the knee. Because there is still persistent thigh fat present following weight loss, liposuction is frequently performed in conjunction with skin excision. Occasionally, this excision is extended into the groin crease to address additional skin laxity of the upper thigh. Skin laxity involving the outer thighs (the saddle bag area) is typically addressed in circumferential body lifting procedures. Healthy patients that have excess skin and fat of the upper and inner thighs may be good candidates for thigh lift surgery. Ideal patients have under gone significant weight loss and have been able to maintain their new weight for at least 6 months. To minimize the risk of potential complications, patients should not be active smokers for at least 6 weeks prior to and following surgery. All patients should be in good medical condition without significant cardiovascular, kidney, or lung disease. Smokers will be asked to quite smoking a minimum of 6 weeks prior to surgery to minimize wound-healing complications. At your initial consult, you will meet with Dr. Neil J. Zemmel to discuss your concerns and your desired outcomes of surgery. Dr. Zemmel will review your medical history, paying particular attention to your weight loss history, overall activity levels, and your past surgical history. In addition to evaluating your specific concerns, Dr. Zemmel and will also perform an assessment of your overall health to identify underlying medical conditions that may affect your results, such as uncontrolled hypertension or diabetes, smoking, and a history of scarring following previous surgery. Based on your history, you may be asked to see your primary care physician prior for a preoperative assessment. Please inform the Richmond Aesthetic Surgery team of any difficulties you may have had with prior surgeries, of all current medications you may take, including supplements, and whether you are actively smoking. If you are an active smoker, you will be asked to stop smoking for at least 6 weeks prior to surgery and to cease smoking for 6 weeks after surgery. Smoking cessation will minimize your risk of potential complications in wound healing and maximize the likelihood of a successful leg recontouring. Based on your evaluation, you will be provided with a detailed surgical plan, tailored to address your specific concerns. Dr. Zemmel will thoroughly discuss the operative plan, risks, and realistic outcomes of your surgery. He will review the planned incisions, and what you can expect shortly after surgery, and your overall recovery. On the morning of surgery, you will meet Dr. Zemmel, who will answer any final questions you may have. You will undergo the necessary presurgical markings to address the areas that were previously discussed in you preoperative consultation. The plans to the operation will be drawn. You will also meet a Board Certified Anesthesiologist and Nurse Anesthetist. Please inform them if you have had any difficulties with anesthesia in the past. You will meet our experienced intraoperative nursing staff who will care for you during surgery. After presurgical markings are performed, you will be taken to the operating room for surgery. Thigh lift surgery usually takes between 2 and 3 hours to perform; however, operative time may be longer if additional procedures are performed. You will also be admitted to the hospital overnight for observation and pain control. Dr. Zemmel believe admitting you overnight to the hospital improves your overall outcome. Your pain and potential nausea will be controlled with IV medicine and you will be well hydrated with IV fluids. Your safety and well being are Dr. Zemmel’s primary concern and every effort will be made to care for you. After surgery, you will notice that your legs will be wrapped in a light compression dressing. Soft drainage tubes will be placed deep to the incisions to collect any fluid that may accumulate after surgery. Your nurses will show you how to care for these drains. These drains are usually removed one week after surgery, depending on how much fluid is draining. You will be able to ambulate after surgery; however, you may initially need some assistance in getting out of bed. You will notice some postoperative swelling and bruising that usually resolves within 1 to 2 weeks, especially when adjunct liposuction is performed. Within the first 1-2 weeks of surgery, you will be placed in a compression garment of a spandex-like material, to assist in reduction of the swelling and in the recontouring of your thighs. Also, in the first few weeks following surgery, you will be asked to keep your legs elevated after periods of sitting or prolonged standing to help reduce postoperative swelling. Some patients will develop some numbness along the incisions, which usually resolves within 3 to 6 months. Rarely, the numbness persists longer or remains permanent. Your newly reshaped leg contours will become more evident as the swelling and bruising subsides. In most cases, you will see immediate noticeable improvements which will continue to improve over time. In some cases, you will see continue improvement in your new looks up to 6 months after surgery. Complications from a thigh lift include bleeding, infection, long-term scarring, asymmetries, and wound healing complications. Fortunately, all of these occur rarely. Other rare complications include blood clots of either the legs or lungs, requiring additional medical treatments. Occasionally, patients may develop fluid collections, called seromas, under the incisions that accumulate after the drains are removed. In most cases, these fluid collections can be drained with a simple office procedure. In the event that asymmetry between each leg persists, or recurrent loose skin occurs, additional procedures may be necessary. As mentioned above, some patients will develop numbness along the inner aspect of the thigh. This numbness usually resolves within approximately 6 months of surgery; however, in rare cases, it is permanent. Surgical excision of tissue of tissue adjacent to the groin crease can rarely cause long term swelling of the leg called lymphedema. Fortunately, the techniques utilized by Dr. Zemmel minimize the likelihood of these difficult complications. To learn more about thigh lifts or to schedule a consultation, please contact Richmond Aesthetic Surgery today for your consultation.